The course was obviously beautiful, but I had to show you the swim and tennis facility. Membership (50k) has its privileges! BTW: that is a house in the background, not a hotel. 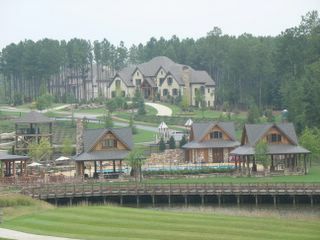 The homes are all on the front nine, each evoking a rustic feel that made me think I was in Colorado, not Georgia. The back nine featured plain and simple nature....actually...a lot of nature....since the back nine is where most of the squirrels and birds that used to live on the front nine...before these mega-mansions were built...live.